A flu vaccine dose beside several needles. Missouri health officials are urging people to get a flu shot this year to prevent a repeat of 2017’s brutal flu season. As of Oct. 6, health officials have recorded more than 60 lab-confirmed cases of the flu in Missouri, according to the state Department of Health and Senior Services. The agency still lists flu activity as “sporadic,” meaning individual cases have been detected but not a regional outbreak. A flu shot “remains the best way to protect people from becoming ill or becoming hospitalized or even dying,” said Sharon Frey, clinical director of the Saint Louis University Center For Vaccine Development. 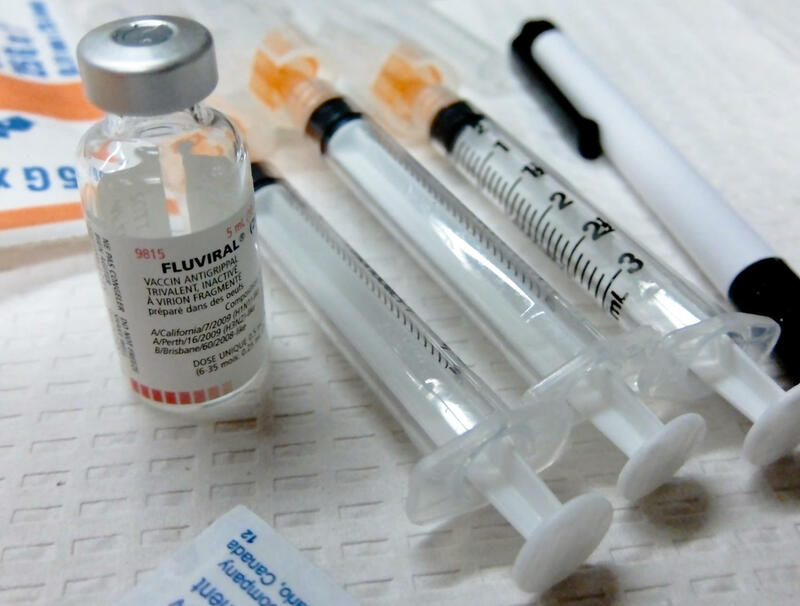 “A person should get vaccinated to help protect their community and themselves,” Frey said. Last year, the state recorded nearly 134,000 recorded cases of the flu, almost double the number from the year before, and 279 Missourians died. Officials said it was one of the worst years in recent memory. Nationwide, there were 80,000 flu-related deaths, according to the Centers For Disease Control and Prevention. Public health officials are never sure how effective any given year’s vaccine will be, Frey said. Prior to the onset of flu season, scientists predict which strains of the flu it expects to be prevalent later in the year and develop a vaccine. But the flu virus can mutate quickly, and some years, the strains change and make a shot less effective. That’s what made 2017 so deadly. The vaccine last year was about 30 percent effective. St. Louis public health officials say they’re worried last year’s brutal season could keep people from vaccinating themselves this year. “While batting .300 may get you in the Hall of Fame in baseball, it’s doesn’t sit well with the rest of us who expect perfection from our health care,” said Thomas Zink, medical advisor for the City of St. Louis Department Of Health. Even if last year’s – or even this year’s vaccine – is less effective, ultimately it makes a person’s immune system stronger, Zink said. Once a person is immunized against a certain strain of the flu, they’ll have defenses for their whole life. It’s still too early to tell if this year’s season will be as serious as last year’s, Frey said. But the severity of the flu varies from one year to the next, partly because people have built their immune system up in years with lots of cases. A flu shot is nevertheless a necessary safeguard, she said. And even if a person is healthy and rarely comes down with a full-blown illness, they can still spread the flu to a less healthy person, which can have serious consequences. Young people, the elderly and people with compromised immune systems due to other chronic illnesses are particularly at risk of potentially fatal flu complications.